Having a little boy opened my eyes BIG TIME to a world of books we’d been mostly neglecting. 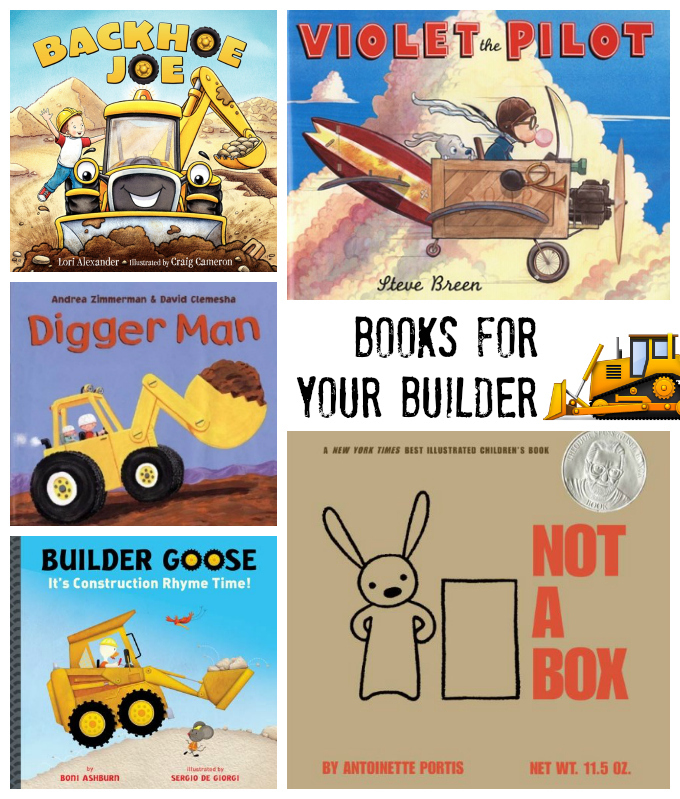 Sure, we read a few truck books when Sophie was little, but when Milo came on the scene and his entire world revolves around All Things Vehicle and All Things Construction, we expanded our book choices. I’m SO glad we did–I didn’t realize what we were missing! Sophie and Milo both LOVE building, creating, stacking, designing, and making things their own. 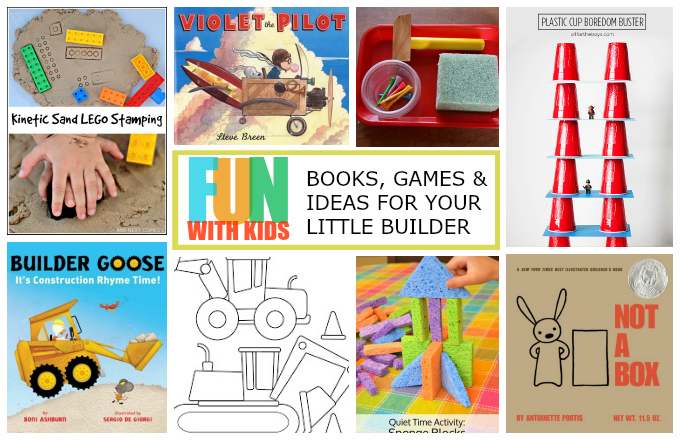 We’ve shared a lot of vehicle books in the past, but today, I’m focused on books, games, and busy ideas around all things building and construction. Preschool and occupational therapy have really opened my eyes to how much more is out there than construction trucks and Legos (though we love construction trucks and Legos!). All children need to develop some spatial reasoning, have time to explore being creative, and use their imagination. Plus, they’ll get to practice fine motor skills while they’re at it. Whether your household is made up of the girliest girls or the most boyish boys, these activities are for ALL kids, and I think there will be something for everyone. Not a Box. This is a fantastic book. It’s about a bunny who uses his box for all kinds–a race car, rocket, boat, building, etc. It’s a good read anytime, but I love it for getting in the mindset of building and thinking creatively. Violet the Pilot. I’m always on the hunt for books about strong, smart girls. This was a great read about a girl who can build a plane out of almost anything and doesn’t care that other people think she’s a bit different. Builder Goose. Both Sophie and Milo LOVED this book. We read it over and over and over again. Sophie loved the songs and rhymes (taken from Mother Goose rhymes), and Milo loved all the awesome construction vehicles and animals. An all around win. Backhoe Joe. A cute little story about a boy who finds a stray backhoe and wants to keep him for a pet. I had to sneak this one back to the library. Digger Man. Sophie and Milo loved this story of an older brother showing his baby brother how much he loves trucks. From the book above, try thinking what else you could make with your box. Decorate “cars” for a drive in movie, build a tower, make a boat… the possibilities are endless. Add some duct tape and scissors to your arsenal and you could make anything from a play house to a train. 2. Play with blocks differently. Use picture cards. In occupational therapy, we’ve been practicing having Sophie build a small figure or structure out of legos to match a picture card. Make your own, or print some out from online. Use blocks to make letters or number shapes. Practice color sorting, or counting out a certain number. 3. Build with something new. 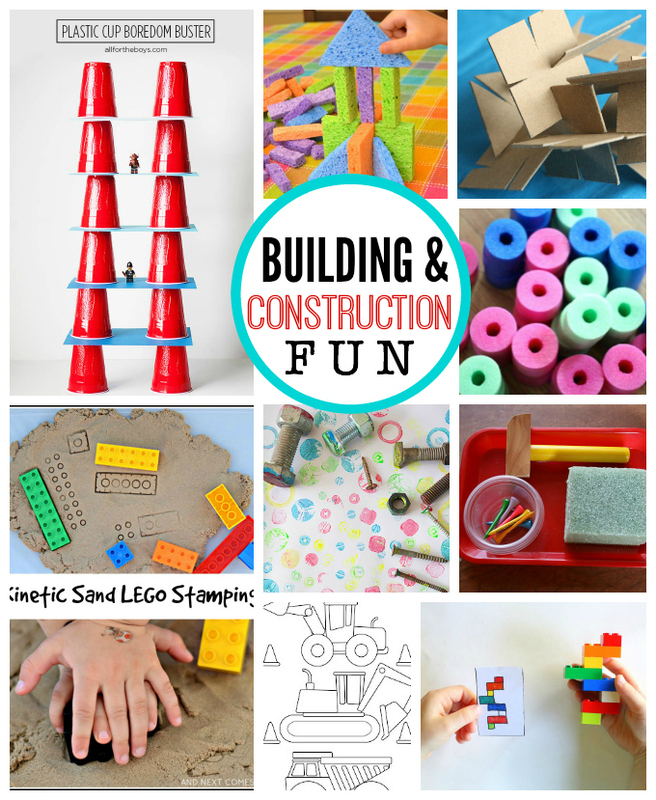 We love bristle blocks, wooden blocks, and duplos , but for a change, why not try one of these? Grapes or marshmallows and toothpicks? Toss some construction vehicles (these are our faves) into a bin with beans, lentils, sand, rocks, or whatever else your heart fancies and go to town. Chisel out a big block of ice. 6. Stamp with nuts, bolts, and screws. This was one of the most popular art activities at Sophie’s preschool this year. We use either these washable paints or finger paints. You can also try stamping with legos in play-doh, kinetic sand, or model magic. 7. Add tools to your favorite play-dough. Poke holes, “drill,” roll out, stack, or pinch your favorite play dough with tools. 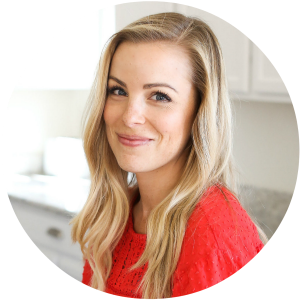 You’ve had so many creative kids ideas lately, you are such a clever Mom! Hi emily, How did you encode your pictures so that when you click on it for pinterest it describes it the way you want it to in the comment section? Does that question even make sense. We used your construction stamping idea for my sons construction party and we all loved it. Thanks for sharing. I found you through Janssen (she and I were friends in Texas). I’m so glad you found me! I use WordPress, and when I upload an image and click on the photo, I can write an “alternative text” or “alt tag” on the photo. There, I type what I’d like the pin-able caption to be. Hope that helps! I’m happy to try to help more if it doesn’t make sense! That was perfect! Thank you. FYI when I write to some other bloggers my email notifies me when I get a response. I didn’t see that in my email (not sure if that is my fault or not).